and Alwida married in 1898 and had two sons James Victor (Vic) and Austin Harry (Ott. ).Before the Mc Coy family moved to Descanso they homesteaded ranch land on Boulder Creek Rd. just south of Julian. In 1928,they moved to the first rock house Harry built in the new subdivision of Descanso Park at 24976 Viejas Blvd. This place became the first of many stone houses for which the Mc Coys became noted. The skill of their rock work was such that each home became a show place. Harry passed on his artistry of masonry to his son, Ott. In 1933 Ott built a home on the property adjacent to his father's at 24978 Viejas Blvd, where Peggy Mc Coy Krahling and her husband still live today. Ott Mc Coy, Peggy's father, an outstanding community figure worked as a rancher, heavy equipment operator, and acting foreman for the Oliver and Van Ort's "Samataguma" ranches during the 1930's and 1940's. He built all the dirt dam on both ranches and still managed to find time to construct the commemorative monument in the Descanso Ellis cemetery. Ott worked at Camp Lockett in Campo as fireman, later he joined the County Road Department and at one time he served as an officer of the Livestock Commission. 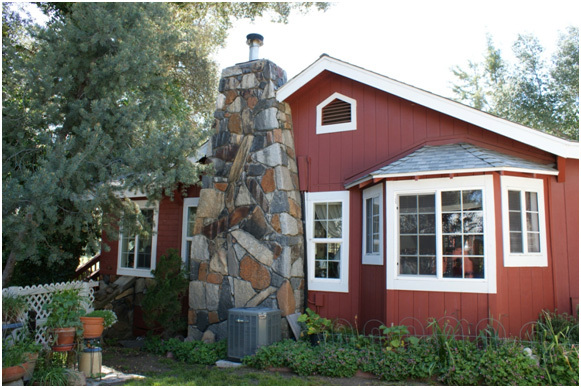 In the fifties Ott built two rock houses in the Descanso Park subdivision. Peggy was born in 1931 on the Samataguma ranch in Guatay when her dad was foreman. She attended the present Descanso Elementary school and continued her schooling at the first Mountain Empire High School on Old. Highway 80. The foundation of this old high school can be seen on the north side of Hwy. 8 about a mile east of Buckman Springs Rd. Her older brother Charles Mc Coy attended the second Descanso Elementary school referred to as the "Red Schoolhouse" as his mother did before him. Peggy remembers several major events from the past such as the 1936 flood when the water was bank to bank and running over the bridge down by the Red schoolhouse and when the snow measured five feet in Guatay in 1949. She remembers the Conejos Fire in 1950 which,"came right down and practically took out the front door.” After the Seventies Fire, her uncle Vic Mc Coy ended up in the news claiming the family homestead wouldn't have burned to the ground if the Forestry hadn't forced him to evacuate. Then there was the Cedar Fire that came roaring through Descanso and nearly burnt down the junction. Many things have changed since the Mc Coy era. 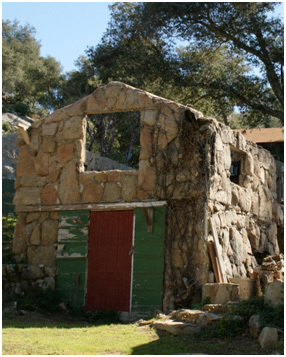 One thing, however, remains unchanged and that’s the rock houses Harry and Ott Mc Coy built in Descanso, Pine Valley and Cuyamaca that are still standing as monuments to a skill seldom seen today. Mc Coy Family information taken from "When Descanso Was Young" Published by the Friends of the Descanso Library and from an interview with Peggy Mc Coy on 5/4/12 by Carol Dearman and Jenny Belle Bowman.